Old Bridge is a bridge on the Red Ring Road south of the Imperial City (quest-related). It carries the Red Ring Road over one branch of the White Rose River. If you are doing the Dark Brotherhood quests, you will find one of your dead drops here. 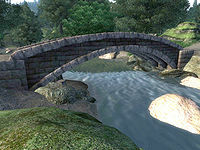 A Nirnroot can be found next to the bridge's eastern end. Esta página foi modificada pela última vez à(s) 06h51min de 14 de janeiro de 2013.